If it's a relaxing Door County stay you're interested in, stretch out in front of a warm fireplace in our lobby or the privacy of your own luxury suite or read a book from our library. 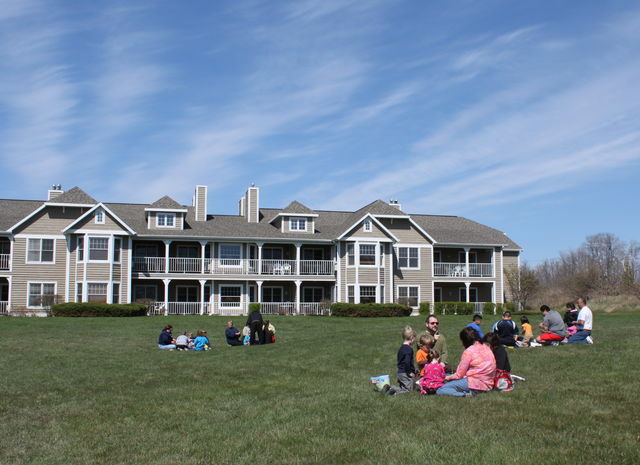 If it's adventure you desire, the resort is just minutes from Door County sand beaches, state parks, golf courses, snowmobile and cross country skiing trails, and lighthouses. In spring visitors are welcomed by beautiful floral displays, including daffodils, tulips and many others. The Door County Festival of Blossoms and Blossom Parade have become a spring time favorite. Autumn's breathtaking fall colors, as well as the festive fall decorations and Egg Harbor Pumpkin Patch Festival, add to the delight of many. It's no wonder Egg Harbor beckons travelers from around the country... and the world! Door County is located between Green Bay and Lake Michigan and offers many great activities. Come to Egg Harbor and enjoy a concert in the park, gelato on a bench, or visit the many wineries and shops in town. No matter the season, there is always something to do here in Door County so book your vacation today! Come discover the beauty of Door County. The peninsula is home to over 300 miles of scenic shoreline which offers sandy beaches, sailing, fishing, charters, even a car ferry ride to Washington Island, and for an experience you will not forget we suggest you try a famous Door County Fish Boil. With beautiful scenery Door County is a great place to take some great pictures and is home to 10 lighthouses and they are all in beautiful locations. There is so much to do here in Door County. Come stay at Newport Resort and experience all that Door County has to offer. From wineries, fishing, art, and golf, there is something for everyone to enjoy in Egg Harbor. Click here for information and activities in Door County.